Tammy and I often have fun times together but sometimes they can be scary as well. Since we had an extra day together last week we decided to take a walk. Our normal walks consist of a quick trip around the block but this was not a normal walk. Groundhog Day’s and Woodstock’s downtown square. We decided to talk a walk to the “Historic Square” in downtown Woodstock. 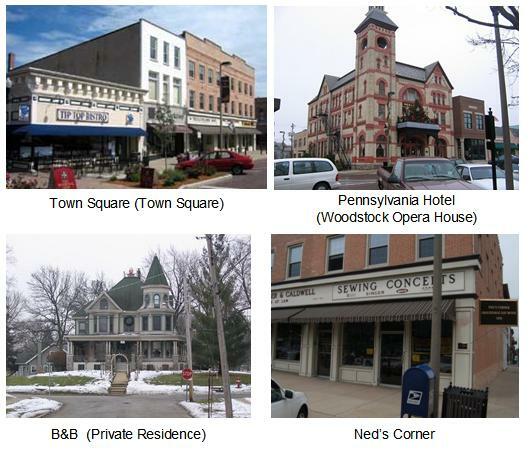 I’m not really sure what qualifies the Square as being historic, because it looks like most of the squares I’ve seen in small towns throughout the South. Having lived in a studio apartment overlooking the Square before Tammy and I got married, I can tell you it’s nothing special. But what does set this Square apart is that it was used as the backdrop for the movie Groundhog Day. 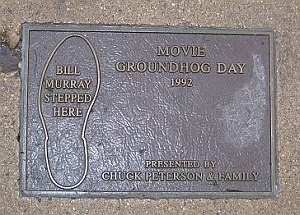 As many times as I’ve been on and around the Square I’ve never seen the special plaque the city put in the pothole where Bill Murphy stepped in day after day in the movie, but I know it exists. The Square was our eventual destination but it didn’t take long for things to turn scary. What I wish Tammy’s Honey Do List looked like. Looking back, I should have known that our walk was doomed from the start. We had barely made it out of our neighborhood when the first scary incident occurred. Tammy: Now that it looks like you aren’t gonna be working for a while, I’m gonna make a To Do List for you. Me: Ehhh, that’s gonna be stupid. Tammy: (after she closed her mouth because she couldn’t believe what I said) It’s NOT gonna be stupid. Me: Yeah is. What kinda stuff is gonna be on it? Tammy: Stuff that needs to be done. Me: Like what kinda stuff? Tammy: I don’t know, like landscaping stuff. She continued adding to her virtual list but I stopped paying attention after a couple of blocks. We made it to the Square and Tammy decided to stop at some of the local shops. I went into the first couple of shops with her but I bailed on the third one. Me: (as soon as I walked in) I’m out. If I had known what was waiting for me outside I would have stayed inside with Tammy. First there was Frizzy Hair Lady. She stopped in front of the window of the store Tammy was in and since I was standing within listening distance I became her audience. At this point I should have picked up my phone and acted like a had a call, but I didn’t. Frizzy Hair Lady: My daughter makes stuff like that. She make costumes. Me: Oh really? That’s cool. I turned away to look around hoping that she’d get the clue that I didn’t want to talk anymore. Fortunately she did. King Kong Bundy or Creepy Donut Guy? As I was looking around I saw what turned out to be my second accoster, Creepy Donut Guy. 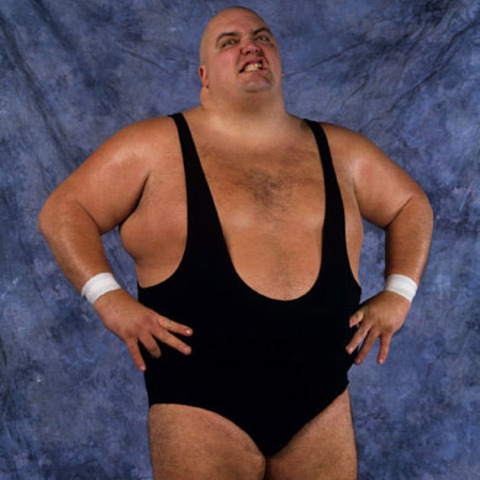 He was kind of like a miniature version of the old WWF wrestler, King Kong Bundy. He wasn’t as tall but definitely had the same build. He was at the end of the block when I saw him, but the next thing I knew he was standing next to me… breathing heavily. Creepy Donut Guy: (loudly catching his breath) I gotta get down to the Mexican bakery to get some donuts. Creepy Donut Guy: I live in the Victorian House across from the service station over on Lake Street. It was at this point that I decided I’d rather be inside with the purses, hats and the other frilly woman stuff. As I was walking toward the door I saw Tammy coming outside. Me: Because I’ve been attracting weirdos who start talking to me. Me: Yeah, there’s Frizzy Hair Lady right there. Then there was a guy who looked like King Kong Bundy. He told me he had to get to the bakery for donuts. I think if you put all of the pieces of teeth he had left together he might have a total of three. Me: You didn’t see him. We made it past bakery Creepy Donut Man was in when I saw The Frizzy Hair Lady and she was headed in our direction. Me: Oh no, there she is, turn right, turn right. Tammy: No, you’re staying in this path, she’s not going to hurt you. Me: No way, turn right, TURN RIGHT. Oh geez…seriously? You won’t let me turn. We made it past her without an incident and decided to stop at a local Mexican grocery store so I could pick up some onions for dinner. About 4.7 seconds after walking in Tammy started making a gagging sound. Tammy: Oh my God!! What’s that smell? Can you smell that? Tammy: It doesn’t stink to you? Tammy: Seriously? Yuucck… It smells like a dead body. Me: It’s not a dead body. Tammy: I don’t know about that. Does this spagaragus tastes like a dead body to you? If there was one thing I learned from the Casey Anthony trial it was that you “never forget” the smell of a dead body. While I can’t say that I’ve ever smelled one, I’m pretty sure the smell in the grocery store was NOT a dead body. 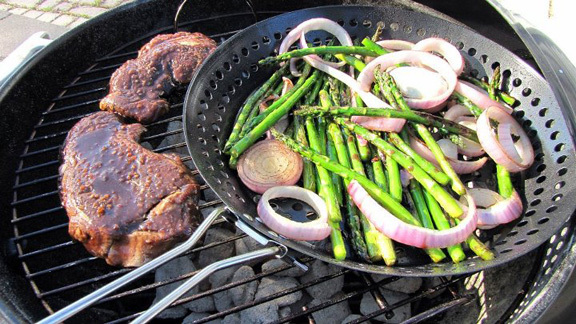 I picked out two onions, paid and when we got outside I heard Tammy exhale. Tammy: whhhhhooooooo… I was holding my breath until I got outta there. Tammy: What was that smell? It was so bad I thought I was gonna throw up. Don’t put those onions on anything you’re making cause they’ll stink everything up. This Pitbull on the side of the road would still be scary. On the way home she started back on my To Do List list but she didn’t get to far when we saw a group of people walking their Pit Bull dog on the other side of the road. Me: He just saw us. Tammy: Yeah and you’re wearing red too. Me: Crap! You’re right! We gotta go but slowly so we don’t attract attention. Later that night while we were having a “Person of Interest” marathon, I told Tammy that I had posted to The Life of JWo five times last week. Me: I need to slow down. Tammy: You will, once I start giving you lists. I told you it was scary. Gallery | This entry was posted in Daily Life and tagged daily life, humor, scary, Tammy, walking. Bookmark the permalink. I always attract the weirdos too and so does my husband. My problem is that I can never seem to get out of a conversation with them. People probably say that about me too. Haha… As much as Tammy says I like to talk, I’m not really one to just walk up to someone and start talking. That’s what just was so weird because I didn’t do anything to encourage them to start talking to me. Copyright © Jason Wommack and The Life of JWo, 2011-2013. Unauthorized use and/or duplication of this material without express and written permission from this blog’s author and/or owner is strictly prohibited. Excerpts and links may be used, provided that full and clear credit is given to Jason Wommack and The Life of JWo with appropriate and specific direction to the original content.